I saw someone post this on Facebook a few days ago, and a couple of these really caught my eye (especially the Shepard sequencer). 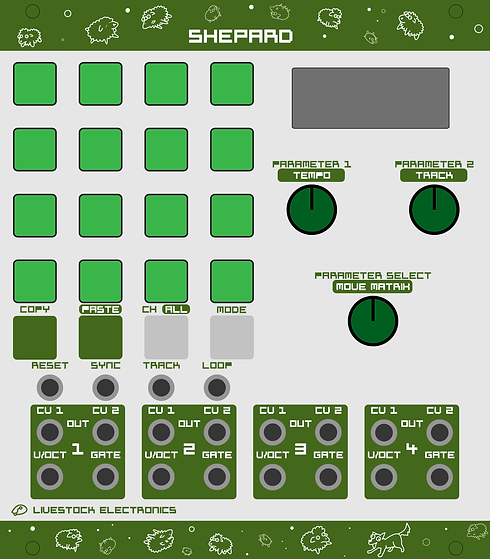 SHEPARD is a 4-channel step sequencer specifically designed for live settings. This module is great for polyphonic and polyrhythmic sequences. And has a lot more to offer than just triggering notes and gates! The interface is divided into two modes, play and edit mode. In play mode loops of several channels can be selected at the same time, and easily duplicated. While edit mode gives you the possibility to create dynamic sequences for each channel. Gates can be delayed or held, notes can be pitched and bent, and sequences can be of different lengths, speeds and directions. Each step can also send two control voltages while triggered, this gives you the option to control other modules during a sequence. The v/oct, cv1 and cv2 outputs can also be used as gate outputs, which means that this module could also be a 12 channel trigger sequencer. The memory has room for 16 different tracks with each 16 loops for each of the 4 channels. The loops and tracks can be selected during play mode, or controlled through cv input. More info on specs soon! BANG is a digital wavetable oscillator in which the resulting wave can be made by selecting “chunks” from two waves. The chunks are indexed as odd or even, each corresponds to one of the two waves. The two waves can be changed with the odd and even knobs. While the number of chunks can be changed with the chunks knob. This can all be changed through control voltage as well. Of course there is a v/oct input which can be pitched and fine tuned. As well as a fm input with a intensity/direction knob. The result is a unique, versatile, yet intuitive oscillator, that reminds us of sounds generated by old game consoles. 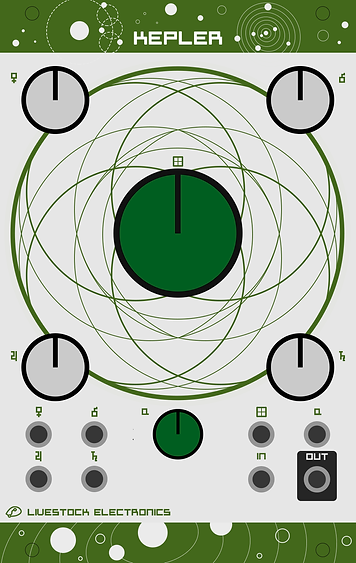 MAZE is a routing and mixing module. Route audio, cv’s or gates to several outputs, determine their intensity and then mix them together. Routings can be saved and selected by a knob or by using the cv input. This module has 4 routable inputs which are mixed when routed to the same output. When holding a button the intensity can be changed with the pot. If no button is held, the pot selects the routing save. KEPLER is a low-pass filter based on the Sallen & Key topology. The sound can range from soft and clean sounding sweeps to highly resonating self-oscillating sweeps. The cutoff is even controllable with v/oct which means that you can also use the filter as an oscillator. The filter consists of four poles that are individually controllable with knobs or cv, and are relative to the cutoff frequency. "Sometimes you just need to work together or take it down"
MIR is a mixer, inverter and VCA. It has four 1:2 mixers VCA's with uninverted and inverted output. Use this module to mix Gates, CV's and Audio, as a signal inverter, as a VCA for modulating amplitude or, as a logic gate. Tags: Dual, Mixer, Logic, Quad, VCA. "Nobody really knows what happened to that cat..."
FELIX is a two 1:3 buffered multiple with attenuators. Use this module to copy CV’s, Gates or Audio and change the amplitude or intensity with the attenuators. You can also use this module together with MIR to create auxillary busses! Looks good, interesting to learn more about them, espacialy the SEQ. It has a puppy! I'll take a dozen. look great, love the livery, very fun and quirky..
No room for the legending shown in the mockup. Wish them luck though, like the look of Maze. Are all these 3U??? The mockups look great but I'd be hard-pressed to fit all that in a panel. Looking forward to checking these out!! Exciting. Interesting... but also slightly skeptical, but hey... who knows? New style of jack socket maybe like the ones you find on an iPhone - super slim - flush to the panel. And a new range of patch leads that are also super thin - the tech is out there just waiting to be used! RCD is 4 HP, those two are 6HP. Well, they have printed the panels already, so should be real enough, I guess! Those graphics are going to be mostly covered up if there are nuts over protruding jack sockets, I'm hoping for a flush jack socket design... that would be very cool! Can't believe I only just found this post. 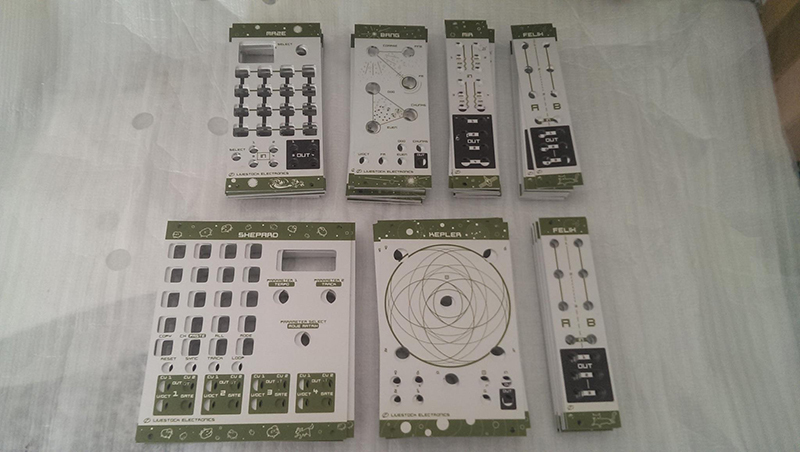 I am one of the guys making these modules. So it's true that working on six modules seems like a lot. Though we have been working on these for about six months straight. Without actually doing anything else, such as being social and what not. But the entire build up to this has been going on for something like a year. The ideas for designs and choosing components and suppliers was in this period. My colleague and I most of the time seem to know the answers to each others problems, which has also led to quick fixing so far. We plan to release each module one by one in the course of this year. Basically whenever we feel that something is ready. Mir and Maze are waiting to have their pcb's redesigned, as we thought of some tweaks in the circuits, especially Maze. Kepler has been really difficult but my colleague has found the source of the problems. So hopefully he can now look into perfecting it, and go from here. All these modules are 3U, we wanted to put the sockets as much together as possible so you have enough space for the knobs. Personally we like to have relatively big and long knobs (ahem) and enough space between them. The knobs we use are Sifam (Intellijel) knobs but higher. The space between the sockets is horizontally comparable to Mutable, and vertically like RCD. We also use the same nuts. Though it is true that the sockets in the mock up are smaller than the actual sockets. As for the graphics in between the sockets, they are put right in between the sockets so if you use fairly slim cables (like doepfer) you can still see them. But we try to place everything as intuitive as possible so once you know the module, you do not need to look. If you still have any questions feel free to ask. How's the Shepard getting along? Would love some more info. The sequencer looks great! I would like more info too. So development on Shepard is going pretty well, we are currently redesigning the pcb's. We are also on a short tour so hopefully we can order these in November. Once we've got the new pcb's we will continue programming. - Number of tracks decreased to 8 (more memory for steps) but leaves you with 128 loops for each channel. We hope to finish it by the end of this year and release it early 2017. I'm interested in hearing more from Bang. I had to sell my shapeshifter due to downsizing my eurorack and didn't have room but miss it dearly. Can you talk about how many wavetables it will have? You can change them via software correct? Yeah so now the code is set for 12 waves, this seems like enough waves to us for the current waveshaping algorithm. Remember that if you use more waves you lose some of the intuitiveness and accuracy of the knobs. The Bang application allows you to either draw or use several mathematical functions to create 12 waves for your own wavelibrary, you can upload these via micro usb cable and a simple click of a button. The application will be updated with new features once released, this depends on what users need. Hmm.. It may be nice to give you the option to choose your own amount of waves, I'm going to look into that! As even though we are only using 12 waves, Bang has room for about 128 (1024 sample) waves, so if you have a different idea for the interface you could also change the internal code using Arduino IDE. You could for instance code something like selectable banks of wavetables! Bang is built with the Mozzi library which also has a lot of documentation and examples as well. And of course our code will be open source. All we ask is that if you create a new idea for Bang, you share your code on the web. We will look into a specific website for that, preferably our own. So it is easy to find all the mods of our digital modules (Bang, Shepard and Maze). BTW. We can leave a spot for more memory on the pcb, which will allow you to add an EEPROM and upgrade it to 256 waves, if you feel it is necessary?! Thank Allert Aalders for this idea!